We hand-craft every part of every doughnut from scratch daily, from the doughs, glazes, and toppings to the pastry creams, jams, and ganaches. We use the finest ingredients available like Callebaut and Valhrona Chocolates, Dulce de Leche from Argentina, fresh fruits, milk, eggs, and cream. Our menu, carefully curated by Chef Christine, features a mix of our signature flavors and creative seasonal twists. Trust us, they are all delicious. 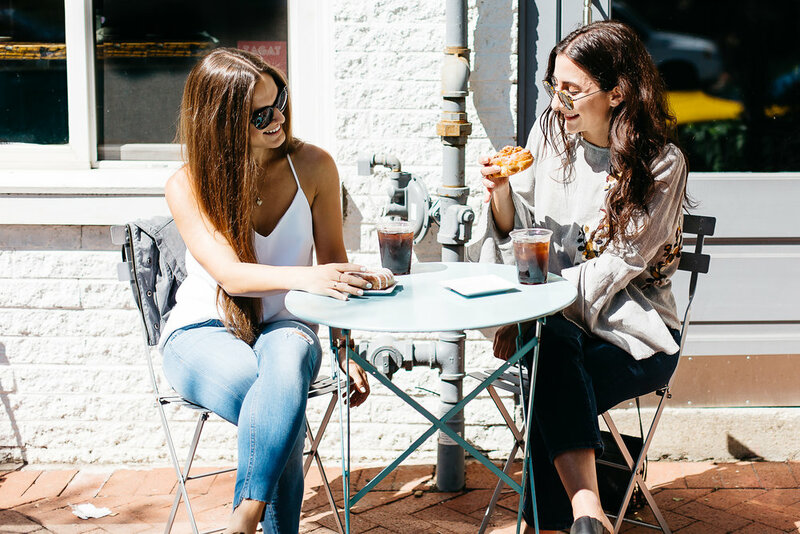 Our philosophy is simple: handcraft the perfect doughnut, pair it with locally roasted coffee, and serve it with a delightful smile. Our two favorite hashtags, #Doughface and #HappinessFound, embody the sense of warmth and happiness that we seek to evoke through our products and service. We make each of our decisions, whether big or small, with a singular focus on quality. Our owner and Executive Pastry Chef, Christine Schaefer, carefully designs every element of our doughnut flavors. It all starts with our signature yeast dough, a recipe that Christine developed over several months of experimentation. From there, she carefully curates our toppings, fillings, and glazes, complete with fresh fruits, Argentine Dulce de Leche, and velvety French chocolates. Think of your favorite dessert, like Key Lime Pie and Valrhona Chocolate Creme Brulee, and then imagine it in doughnut form. When you set foot in one of our stores, you are greeted with a cheerful “Welcome to District Doughnut!”. You’ve made it. You’re here. And we can’t wait to treat you. Our menu features a combination of Chef Christine's year-round favorites and seasonally inspired delights. Join us in the Summer for Key Lime Pie and Strawberry Old Fashioned, or find us in the Fall for Sweet Potato Pie and Maple Butter Pecan! All orders must be placed by 3PM the day before. Please note that we rarely accept same day preorders. Delivery Orders: All delivery orders come from our commissary kitchen. Our delivery radius is to DC and Northern VA. For anything further, please contact us through the web chat! Pickup Orders: Pick ups are available within store hours! Questions about your order? Use our web chat or email us at orders@districtdoughnut.com! Our doughnuts are available for sale at our store, for preorder pick-up, and delivery. We occasionally sell out of flavors. If you know in advance that you want doughnuts, we highly encourage preorders! Please note that all preorders must be placed by 3PM the day before so that our chefs can prepare properly! Q: How do I pre-order doughnuts for pick-up or delivery? A: To pre-order doughnuts for pick-up or delivery, visit our Order Online links below. At minimum, all preorders must be placed by 3PM the day before. For an order on Thursday, the order must be submitted on Wednesday by 3PM. Q: What flavors are available for purchase? A: Our menu is seasonal and carefully curated by Chef Christine. See the Doughnut Menu section above for a list of all of the doughnut flavors available for the current season’s menu. The flavors listed are the only flavors available. Q: How far in advance do I need to place a preorder or delivery order? A: All orders must be submitted by 3PM the day before, at minimum. Every element of our doughnuts is prepared fresh, from scratch, in small batches. 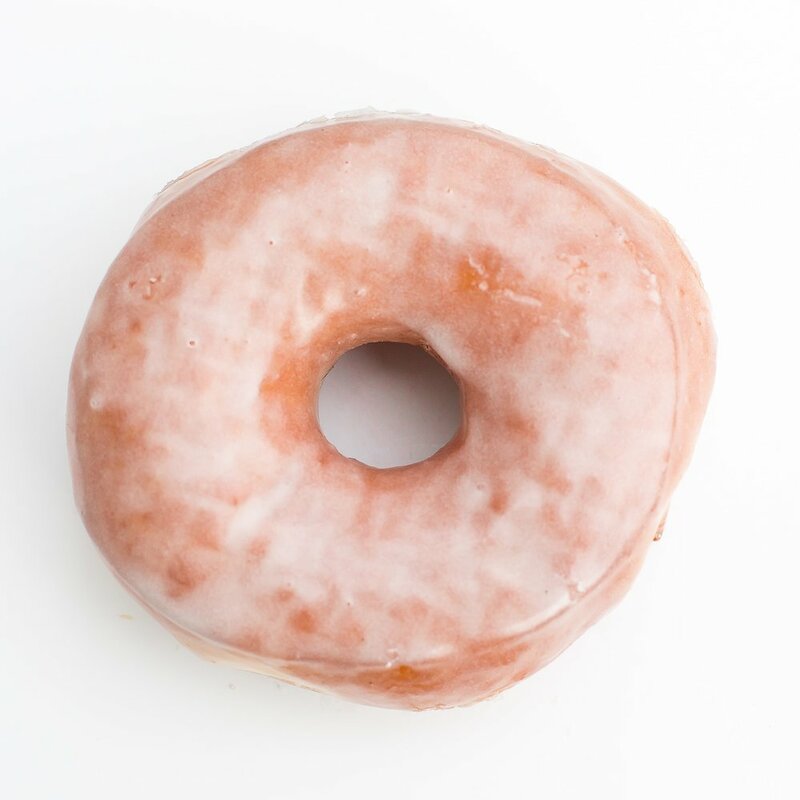 We plan our doughnut quantities based on a number of factors, including preorders. For example: to place an order for Friday, the order must be placed by 3PM on Thursday. Q: Do I have to order my doughnuts in advance? A: No! You can purchase our doughnuts at our Barracks Row or Georgetown stores, as well place preorders for pick-up and delivery. For our store location and hours, please visit our Locations section. Q: Can I order a flavor that is not available on the desired day of my order? A: Currently, we are only able to offer the selection of flavors available on our Doughnut Menu page. Please contact our Customer Service team for any special requests. You may contact us through the chat in the bottom right or by emailing orders@districtdoughnut.com. SAME DAY DELIVERY: Only available through Postmates and UberEATS. FUTURE DELIVERY: For future delivery orders, please place the order through our Order page. Q: Do you ship your doughnuts? A: Sadly, we cannot ship our doughnuts because they are made fresh from scratch every day and are free of preservatives. So, they have a very short shelf life – which is why they are so delicious! Q: Do you serve gluten-free, vegan, or dairy free products? A: Not yet! But Chef Christine is working on them. We will announce heavily if and when these are available. Q: Do your doughnuts contain nuts? A: Yes, some of our flavors contain nuts. Our Doughnut Menu page will detail which doughnuts contain nuts. Please note that our doughnuts are made in a kitchen in the presence of nuts, but only certain flavors contain nuts.